Chile peppers grow readily in NYC—a simple urban garden can sometimes out-produce a gardener’s ability to use them while fresh. Luckily, preserving them is easy. They can be air-dried, dehydrated, or pickled in vinegar brine, but making homemade hot sauce is one of my favorite techniques. Hot sauces play an integral part in food culture and cuisines throughout the world and can add flavor and heat to anything you are preparing. They may be chunky like a relish or chutney, thick and smooth like ketchup, or spreadable like jam, like this chile paste. Chile pastes are common in Chinese, Korean, Mexican, Tunisian, and Hungarian cuisines, but they’re especially important in Southeast Asian cuisine. You may be familiar with the bright red version known as sambal oelek, found on the tables of Asian restaurants throughout the city. Below is a variation that’s easy to make and a bit sweeter than the commercially produced variety. It’s part jelly, part chutney, part paste and has a sweet, sour, salty, and very spicy flavor that will make any dish come to life. Try it on rice or noodle dishes or scrambled eggs, mixed with barbecue sauce, or my favorite way: spread on crostini with goat cheese. Warning: Wear kitchen gloves any time you are working with chile peppers to protect your hands and eyes. If you do touch a chile and begin to feel a burn, immerse your finger or hand in milk, the antidote to capsicums’ sting. Heat: Only as hot as the peppers you use! Add the mix to a cold frying pan and turn the heat to high. Stir with a wooden spoon as it heats and add the sugar. The sugar and vinegar will combine and begin to caramelize, tying all the flavors together. Stir gently, being careful not to breathe in too deeply, and cook over medium heat for 10 minutes or until the mixture stops looking raw and the sugary syrup has begun to thicken. Add the remaining lime zest, turn off the heat, and stir a bit more. Store refrigerated in a jar for up to a month and enjoy! 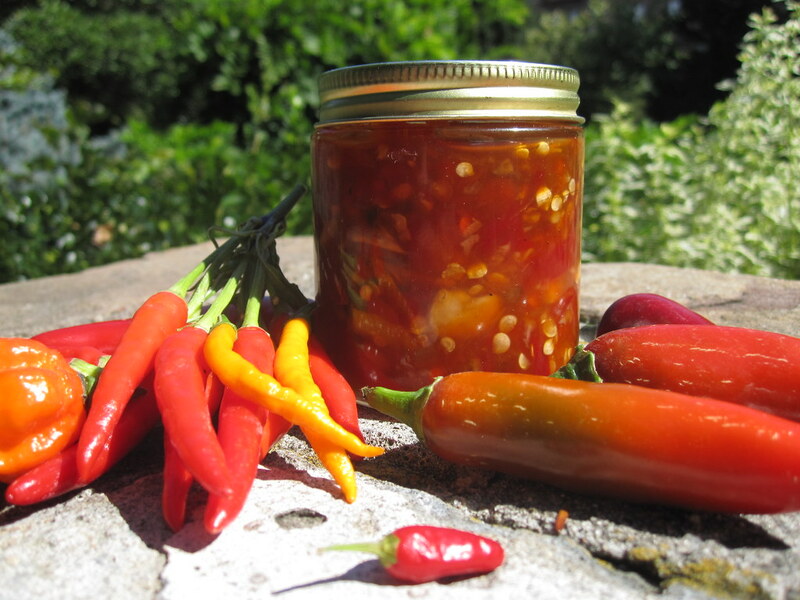 Hot peppers of all kinds can be used to make this delicious sambal, a type of chile paste common in Asian cuisines. Photo by Ariel Nadelberg.